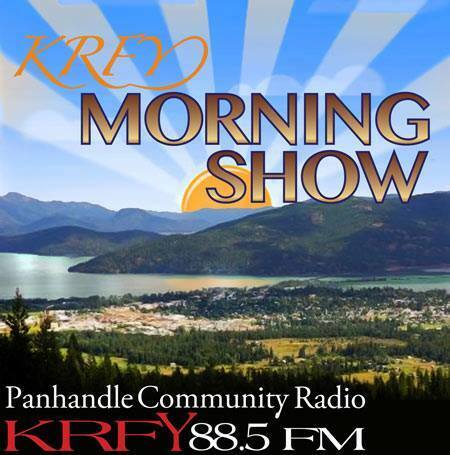 Here’s what’s coming up the week of August 20 – on the Morning Show on 88.5 KRFY. Airtime is 8 a.m. … but if you miss a show, you can hear a recorded podcast of it later in the day, on our Podcasts page. Tuesday, August 21: Host Julie Kallemeyn will interview Jane Fritz with information about the Music Conservatory of Sandpoint. Tune in at 8 a.m.
Wednesday, August 22: Hosts Chris Bessler and Ryan Baumgartner will sit down with Geremy Grimm and Megan Lawson from The LOR Foundation and Headwater Economics. Airtime is 8 a.m.
Thursday, August 23: Join hosts Jack Peterson and Jim Healey. Their guest will be Cameron Rasmusson in to talk about the upcoming Sandemonium event. Airing promptly at 8 a.m.
Got a question for any of our Morning Show guests? We like to ask questions from listeners, but you need to get it to us in advance of the show! Just drop us an email at krfy[email protected] or call and leave a phone message at 208-265-2992.